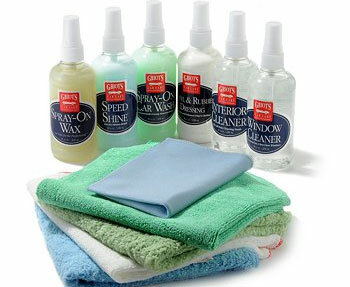 Synopsis: Get started with Griots Garage detailing products for your MINI. I must have some form of ADD because I like to have all of my stuff match whenever possible. Before finding Griots Garage I had a mishmash of detailing products from just about every company. Some from Mequiars, Turtle Wax, etc etc. It seems that every time I went to the store to buy more stuff they discontinued the brand or product that was used to or I decided to try something new. My detailing product collection looked like a mess and some of the products actually caused other products to not work as they were engineered to- particularly waxes and polishes. Once I realized the depth and consistency of the Griots Garage line of products I was smitten. I could buy ALL of the products AND detailing tools from ONE source! All the labels matched and they work great together. And just looking at the array of matching containers and graphics in my detailing section of the garage made me feel like half the battle was already won! It's amazing how just that simple thing makes detailing so much easier. I know I have what I need at a quick glance because all of the labels match and I can clearly read what each bottle is and can SEE the color of each so I know what it is without even looking at the label. With other detailing products that have opaque containers there no way to know without picking it up now much is left. So, anyways, I started fresh with just about all of my detailing stuff once I added the Griots Garage line of products back in 2008. At that time we were among the first companies that Griots garage had ever worked with as a vendor/supplier in the retail market as they had really never ventured out of the manufacturer to consumer pattern they were used to. I use Griots Garage products to detail my own MINI and have yet to find a product that I need that they don't offer. If you're new to the world of car detailing or want to test out the Griots line of products you may want to just buy this Griots Garage detailing kit that has a nice cross section of their most popular products. The small easy to handle 8 oz bottles are refillable (you can buy 35 oz and Gallons of just about everything they offer) and are quite affordable.